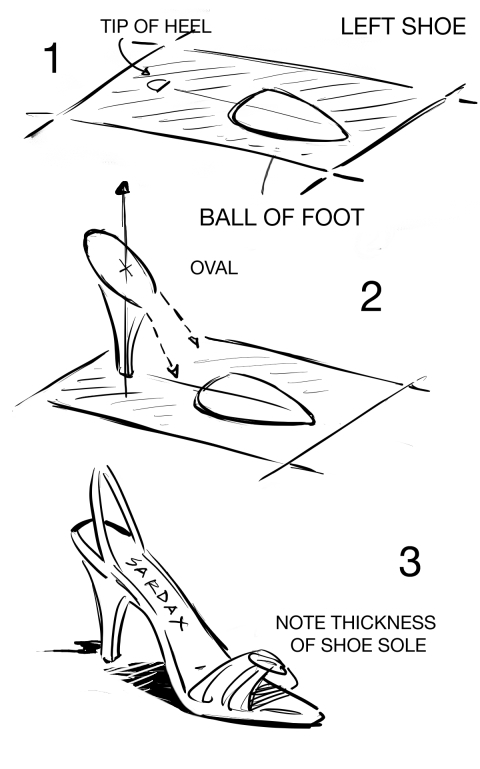 So someone asked me to show how I draw a high-heel shoe. High-heels are not easy to draw. I’ve seen the most adept artist stumble over them. The problem is the subtlety of the curves and an understanding is needed of the shape of the foot which they cover. Let’s start with a simple sandal. Find or buy – or beg for -a shoe and examine it. A high-heel, like any shoe, is a platform for resting on a level surface.The foot rests mainly at two points – the ball of the foot and the tip of the heel. These two points are a constant distance apart, in the same alignment and in the same plane, whichever position the shoe is in . 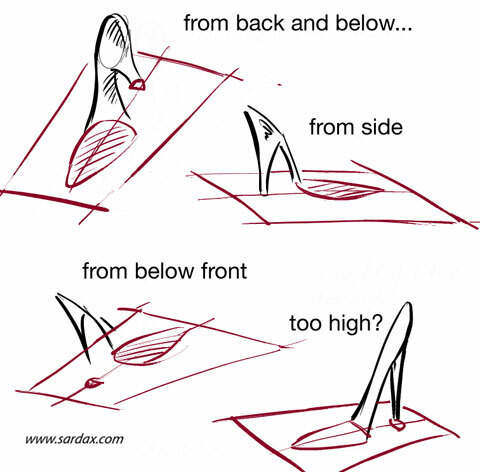 Understanding this is the key to drawing a high heel in any position. The front area itself will be a roughly pointed oval shape, flattened behind following the shape of the foot . It is not symmetrical – rather flattened on the inner side following the shape of the foot. The back area (the heel tip) is a much smaller round area often squared off in front. Any drawing of a high-heeled shoe should start with a rough representation of these areas. 1)A line to indicate the direction of the shoe should be the first. 2)Then you can decide on how high the heel is to be and draw a line roughly perpendicular from the heeltip, and begin to work out the shape of the heel itself. It tapers gracefully downwards at the back. Then you can start roughly sketching the area where the heel of the leg itself will rest – for now you can make this an oval. On higher-heeled shoes this will need to be steeper sloping. 3) Now connect each side of this oval to the lower ball-of-foot area. Note that the resultant line is curved differently according to its being outer or inner side. Just like the foot itself , the curve is gentler on the outer, more pronounced on the inner. So now we are almost there for the foundation. 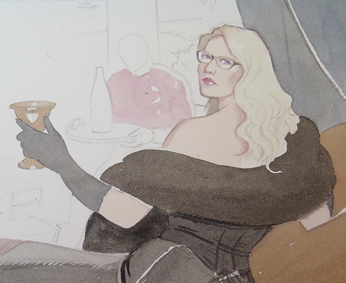 If we are drawing a high-heeled sandal the matter is almost finished-simply show a thickness to the sole. Follow the same principles for court shoes and other but build up walls from the sole and a covering for the tip of the toes.. Observe the countless ways straps are employed – some very simple, others extraordinarily complex. An initial sketch was made on rough paper then scanned into the computer . I prefer to sketch things out on paper-it is also possible to sketch on the computer using drawing software ( Corel Painter ), but I find I can get better results the conventional way. On the scanned drawing I experiment digitally with colours and tonal balance. 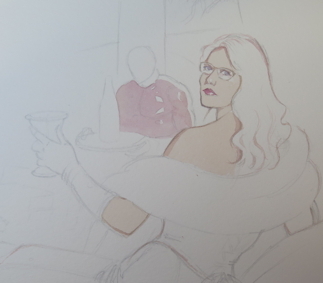 Digital is best here for colour roughs as you can change it so easily. This is printed out and the line-work is transferred down on to thick watercolour paper-(for the geeks this is 300gsm Saunders Waterford HP). Everything is worked out except fine details before the artwork is started. Trying to draw straight on to the paper without planning is asking for trouble. 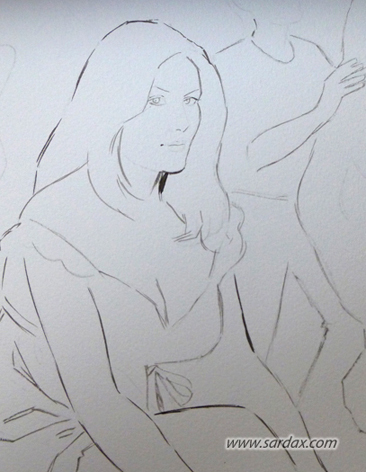 First lines lightly sketched using diluted black paint. Just as a guide. It will be strengthened later . To the left a sheet of photo references is always to hand. Now areas of tone start to be blocked in. This need not be too fine as they are going so dark anyway any imperfections can be covered. 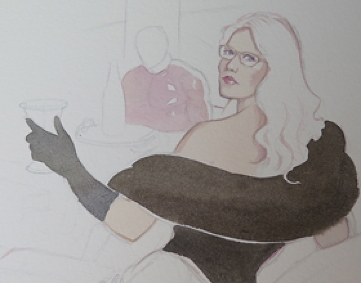 More blocking in. The colouring is gradually built up. At this stage you begin to start balancing all the tones out. I feel that the subject should be glowing so she is the lightest part of the picture. Everything else is dark in comparison to her. This lightness is of course the whiteness of the paper coming through, the unique property of watercolour. 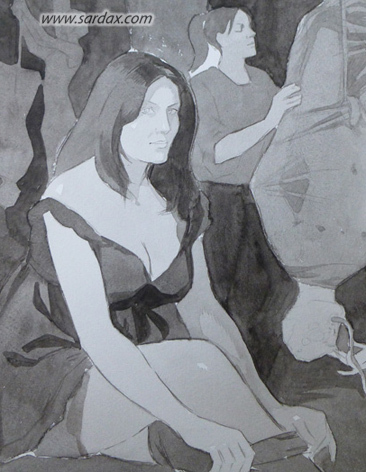 Painting white onto watercolour paint is occasionally necessary but is to be avoided as much as possible. Then you can allow yourself the luxury of cleaning up the details. My basic principle is to work from general to detail. Never to get bogged down in one part at the expense of others. It is very tempting to work up the “interesting bits”- face, etc. and then get depressed looking at all the unpainted background. I feel the best approach is to bring up all the picture together stage by stage. Now framed and hanging in Ms Martina’s chambers. It is A3 size. An initial sketch is made usually on rough paper then scanned into the computer and some indication of tone is worked out on the file produced. This digital drawing is printed out and the line-work is transferred down on to thick watercolour paper. 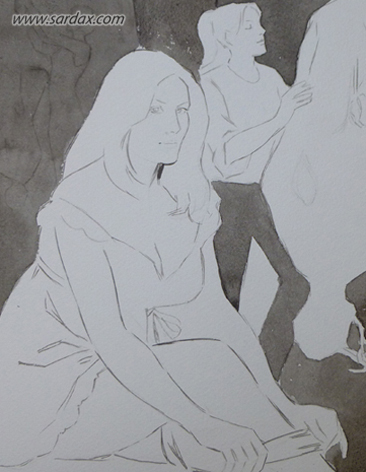 The first outlines are traced out in diluted black watercolour paint to define main areas of tone. 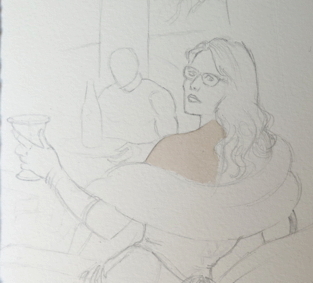 Now darker areas of tone are blocked in. This need not be too fine as they are going so dark anyway any imperfections can be covered. My basic principle is to work from general to detail. Never to get bogged down in one part at the expense of others. It is very tempting to work up the “interesting bits”- face etc and then get depressed looking at all the unpainted background. I feel the best approach is to bring up all the picture together stage by stage. Please visit www.sardax.com to see this and many others.